Kiwi plantation that started for the first time in the Darjeeling hills in 2014 on an experimental basis appears to have borne fruit as farms are laden with the oval-shaped edible berries. The Darjeeling Krishi Vigyan Kendra, which operates under the Uttar Banga Krishi Viswavidhalaya, had planted kiwi fruits as a pilot project in its farms in Upper Dalapchand village, 6km from here, in 2014. It had acquired different varieties of the fruit from Dirang in Arunachal Pradesh. "We had set up eight units in our farm and planted 10 saplings each in all of them. Although, it usually takes three years for a kiwi plant to bear fruits, our plants started bearing fruits in the second year itself," said M.W. Moktan, senior scientist and head of the kendra. The kiwi fruit, also known as Chinese gooseberry, grows on vines like grapes. Most kiwis are oval in shape with a fuzzy brown plumage. Their insides have bright green flesh and a circle of dark seeds in the middle. The fruits make up a good commercial crop. The senior scientist said: "Depending on the outcome of our experiment, we want to promote kiwi as an alternative commercial crop in the hills. A kg of kiwi costs between Rs 400 and Rs 600 in Siliguri markets." "The fruits in the farm will be allowed to mature for about a month and then they would be taken to the lab for quality test. We will be testing the fruits' colour, flavour and juice content. If everything goes well, we will carry out awareness campaigns among the farmers to encourage them to take to kiwi plantation," Moktan said. Moktan added: "As far as I know, this is the first experiment with kiwi plantation in the Darjeeling hills. 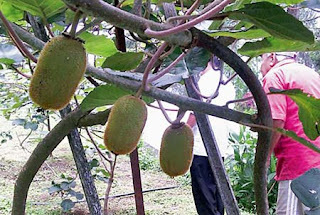 Sikkim had started kiwi plantation before us. "Cultivation of kiwi fruit spread from China in the early 20th century to New Zealand, where the first commercial plantings occurred.